USNPL - This site gives you links for newpapers in every state, large cities and small towns included. I found my hometown, did you? A fun thing- go to Wikipedia , type in your birthday, month and day only. It shows everything important thant happened on that day, people who were born and died on that die, very interesting stuff. I discovered Cleopatra died on my bd and that my bd is Mother's Day in Thailand. 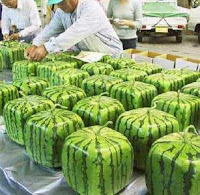 How to grow square watermelons - enough said! Track your Goals - Whether it be losing weight, organizing your life, daily living, whatever your goal is large or small, this is the place to keep track of them. Every Life has a Story - Are you a writer? Keep a journal? Scrapbooker? This site is pure inspiration! Jan Brett - For those of you with children, this is a great site with games and lots of printables. 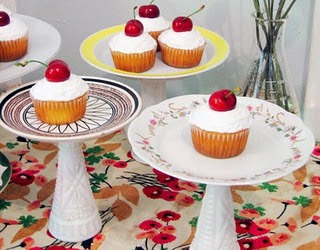 From Design Sponge - Recycled cake plates.